Evan Blass has opened the leak-gates on the Tab S4 with three images of the optional keyboard cover and pen as well as the back of the white variant. It doesn't seem like that long ago, but the Galaxy Tab S3 officially debuted almost one-and-a-half years ago. In other words, it's overdue for a replacement. We'd heard about the Tab S4 passing through the Wi-Fi Alliance and the FCC, but hadn't seen it in photos - that is, until now. The most striking part of this image is obviously the front. Whereas the Galaxy Tab S3 had a 4:3 screen surrounded by thick bezels all around with physical buttons on the bottom, the Tab S4 looks to have a 16:9 display with much slimmer bezels and no physical home or capacitive buttons. It makes the tablet look a lot more modern, though the fact that there's no fingerprint sensor visible must be mentioned. It's possible that Samsung will include an in-display sensor, though that's unlikely. It does look like there's an iris scanner up top, which might be all we get for biometric security. 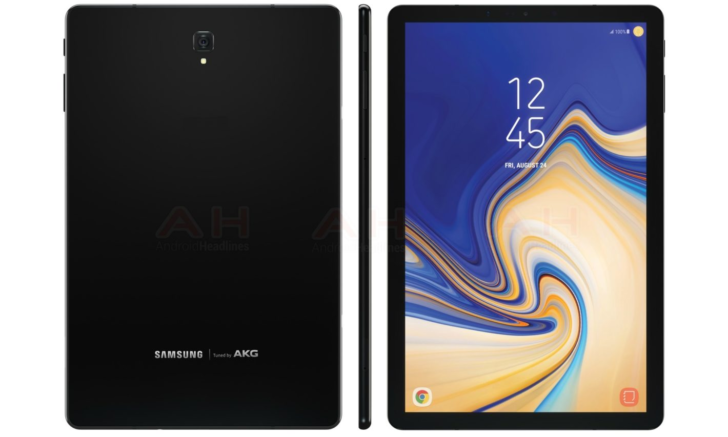 Spec-wise, the Galaxy Tab S4 is expected to have a Snapdragon 835, 4GB of RAM, 64GB of storage, a 13MP main camera, an 8MP front-facing camera, and a 7,300mAh battery. Android 8.1 Oreo and DeX support are expected as well. Chances are that we'll be hearing more about the Tab S4 on August 9th, so we've probably got a little over a month to wait.